Is Mixing Alcohol and Klonopin Dangerous? Klonopin is an effective benzodiazepine medication typically prescribed for anxiety sufferers. It is an older drug and its danger when mixed with alcohol or other substances is well known. Taken as prescribed, Klonopin is a safe and effective medication. But when it is combined with alcohol or otherwise abused, Klonopin can be deadly. What are the dangers of mixing alcohol and Klonopin, and is this behavior always indicative of a substance abuse problem? The following article will explore the side effects of Klonopin and alcohol, what happens when the two are mixed, and where someone can go for help if they are struggling with addiction. Both alcohol and Klonopin depress central nervous system functioning. When taken together, these effects become more pronounced and can even be deadly. Depressed breathing, heart rate, and a loss of coordination are the most marked and dangerous side effects. When Klonopin and alcohol are mixed, dangerous side effects of the drug and alcohol are enhanced. People who do this risk overdose, hospitalization, serious injury, and even death. Why is mixing Klonopin with alcohol so dangerous? Klonopin is similar to alcohol in that it also acts as a central nervous system depressant (CNS). For anxiety sufferers, Klonopin is highly effective for eliminating extreme feelings of fear and worry. Klonopin gives patients a sense of calm and relaxation. This feeling can become addictive, however. Because CNS depressants like Klonopin and alcohol increase drowsiness, and depress breathing and heart rate, combining these substances intensifies these effects. This intensifying effect is what makes combining the two so dangerous. Even small doses of Klonopin and alcohol lead to a lack of coordination and drowsiness. This increases a person’s chances of falling and seriously injuring themselves. Also, depressed breathing from mixing Klonopin and alcohol means the individual cannot get enough oxygen. If someone combines Klonopin and alcohol and becomes unresponsive and their lips or fingers begin to turn blue, then they are in serious danger. If this happens, it’s crucial that they get swift medical attention. According to a 2014 SAMHSA study, 32% of all ER visits for benzodiazepines like Klonopin resulted in serious outcomes for the patient, including permanent disability and overdose deaths. 44% of all surveyed ER visits involved mixing drugs like Klonopin with alcohol. Who is most likely to abuse alcohol and prescription drugs like Klonopin? Is mixing alcohol with Klonopin always a sign of an addiction problem? Mixing alcohol and Klonopin is never advised by a medical professional. Combining these two substances is dangerous and puts the individual’s health at extreme risk. Anytime a person uses a prescription medication for other than its intended use is abusing it and this is a sign of a serious substance abuse disorder. Left untreated, a substance abuse problem and an alcohol abuse problem can cause severe, potentially deadly consequences for the individual. It’s crucial that people who struggle with alcohol and prescription drug abuse get help before they harm themselves. 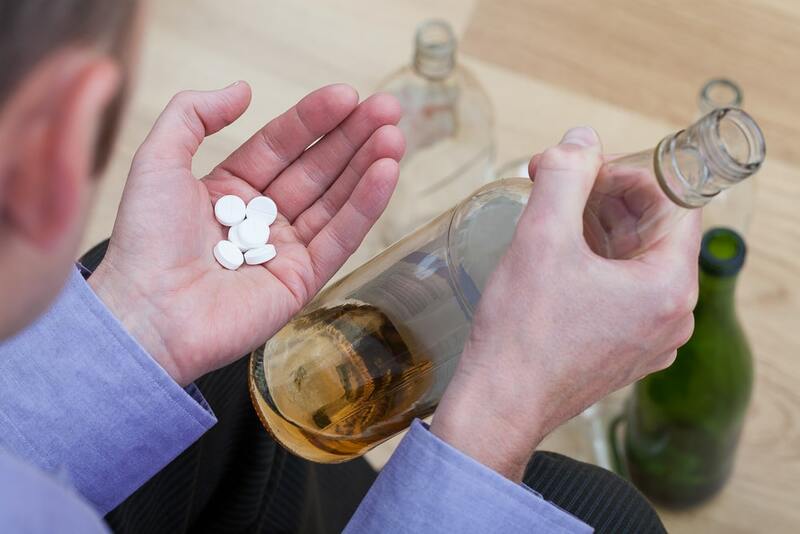 Can rehab or detox help someone with an addiction to alcohol and prescription pills? Rehab and detox can help someone overcome an addiction to alcohol and Klonopin. Depending on the severity of the addiction, the patient may need to spend some time in a medical detox facility. For people who abuse more than one substance at a time, detox is usually recommended. During detox, patients are monitored for withdrawal side effects. Doctors are able to taper patients off prescription drugs safely, and can also give them medications to lessen the severity of withdrawal symptoms. Once the abused substances have worked their way out of the person’s system, patients can attend either an inpatient or outpatient rehab center. Inpatient rehab is a more intense treatment method, where patients live on site for a set period of time. It can be weeks or months depending on many different factors, such as the severity of addiction and if the person has adequate support to stay in inpatient rehab. Outpatient rehab is when patients are required to check in to the facility for treatment at certain times during the week. It is during outpatient or inpatient rehab where patients are given access to trained therapists and counselors, support staff, social workers, and doctors. A team of medical professionals is put in place to assist the patient with all aspects of their treatment. Treatment plans are tailored to each patient. Patients may receive CBT, DBT, or a combination of group or family therapy while attending rehab. After a person has completed either inpatient or outpatient rehab, it is critical that they continue to receive ongoing aftercare and treatment. Addiction is a lifelong illness that requires ongoing care. Although there is no cure for addiction, it can be managed successfully, and people with the illness can live healthy, sober lives. Aftercare programs can help patients avoid a relapse or receive swift attention and care if a relapse does occur. If you or a loved one are struggling with a prescription medication and alcohol addiction problem, reach out a trained drug abuse counselor today and get the help you need.